Fortunately, when farmed responsibly, Atlantic salmon is also a sustainable choice, with our Organic farmed salmon one of the most responsible choices of all. But any salmon you buy from us comes with the assurance of high welfare standards and proper environmental responsibility. We set high standards for our BigFish Brand suppliers and won't buy salmon from those that don't meet them. Of course we are in total agreement that you should choose your fish carefully. Overfishing and irresponsible fishing have put many wild stocks in danger and have also done a lot of damage to the marine environment. Fortunately, practices are improving and it is now simple to identify which wild species are sustainable by choosing fish that carries the Marine Stewardship Council’s blue logo. Salmon is Britain's favourite fish and the reasons are obvious. It is rich in healthy Omega3; available all year round and being farmed does not deplete precious wild caught resources. 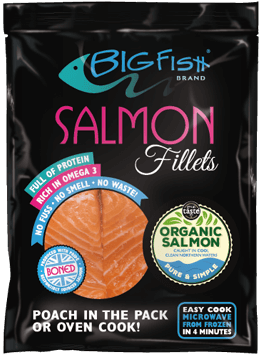 Choose BigFish Brand salmon and you can also be sure it comes from properly managed farms.